I'm back with another glimpse into my fun Austin project. Today I'm showing you the family room. This home doesn't have a formal living area, and so our challenge with this space was to make the family room formal enough to walk right into from the front door, but casual enough to kick back and watch TV in as well. All of the fabrics in the room are durable, upholstery weights that stand up to lots of use. 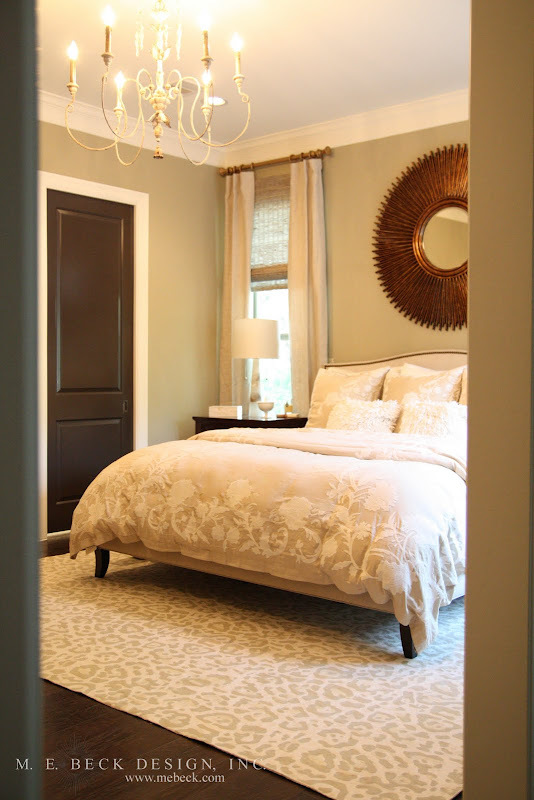 We opted for a casual jute rug to tone down some of the formality of the space. 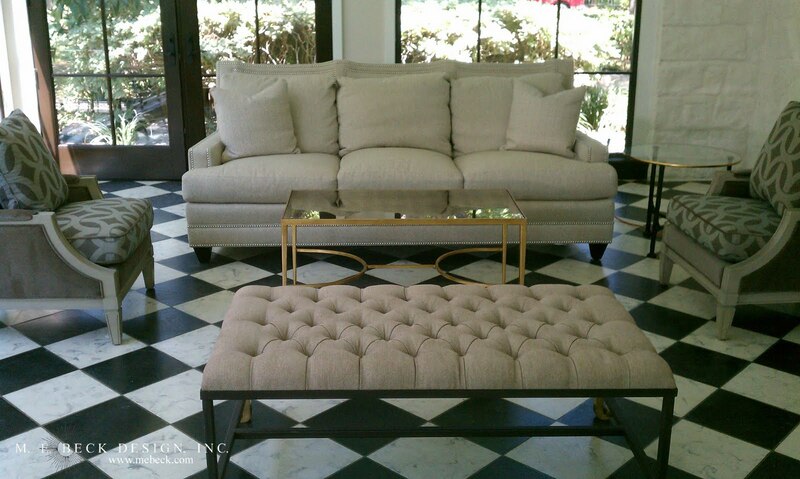 I love the natural element that this introduces, especially paired with the brassy and antique mirrored cocktail table. The antique mirror is great for setting drinks on etc. and you don't have to worry about keeping a pristine glass top. I went with a strong dose of symmetry in this room and I love the mirrored effect it creates. Sidenote...we eventually plan to mount a motorized painting over the flatscreen. The ceilings are high in this space, so we warmed them up with distressed and gray-washed wood beams. We brought even more warmth down into the space with the iron and wood beaded chandelier. I love the rustic materials of this chandelier paired with some of the more refined finishes in the space. Notice the beaming is continued into the lintels of the pass throughs. In the background you can see more of the delicious dark painted doors. Another fun architectural element you will see repeated throughout this space is the slurried stone. We brought this in from the dining room (that I wrote about here) and applied it to the gallery pass throughs and the fireplace. It is slightly rustic but just smooth enough that it works, again, with the more refined finishes and furniture. This space is open, all around, to the entry, kitchen and hearthroom, but feels very cozy due to our warm finishes, fabrics and overall color palette. I love to use these antique leather bound books. I actually collect them myself. They are just beautiful! A bronze lantern sits atop a cararra marble and black lacquer table. The cocktail table sports some pretty cocktail books and a phaleanopsis orchid in a shell planter. Isn't that planter cool? !...those are tons of mini seashells. There is still lots more to see from this gorgeous home! Check back later this week for another Nursery Journal entry. In case you missed them, check out Part I & Part II. Our rocker/ swivel-glider arrived...yay! It is perfect! I quizzed lots of mommy friends and everyone pretty much said the same thing and that was to get a comfortable rocker! This chair is so comfy, and the back is high enough that it completely supports my whole head, which is a plus since I've also been informed that I will likely be sleeping here in the beginning. It is stylish to boot! I opted for a non-nurseryish fabric that can grow with our girl if it stays in her room or could easily be moved to another room in the house if needed. I love it! We are awaiting her bedding and drapes to come back from my workroom. I've also ordered room-darkening woven wood blinds that will be installed in the next couple of weeks. This past weekend we worked on the closet for the princess. Daddy is painting it the same blue as the ceiling and I've painted her hanging rods gold. Cute! She also has a sweet little chandelier that it just waiting to be hung in there. Remember my project in Austin that I keep gushing about? Well, here's a little more of it. This is the master suite. Dang, I should have ironed that duvet! These aren't my final photos anyway, there were a few things missing across the room and so you're only getting to see half of the space :-) It's about 90% done though. 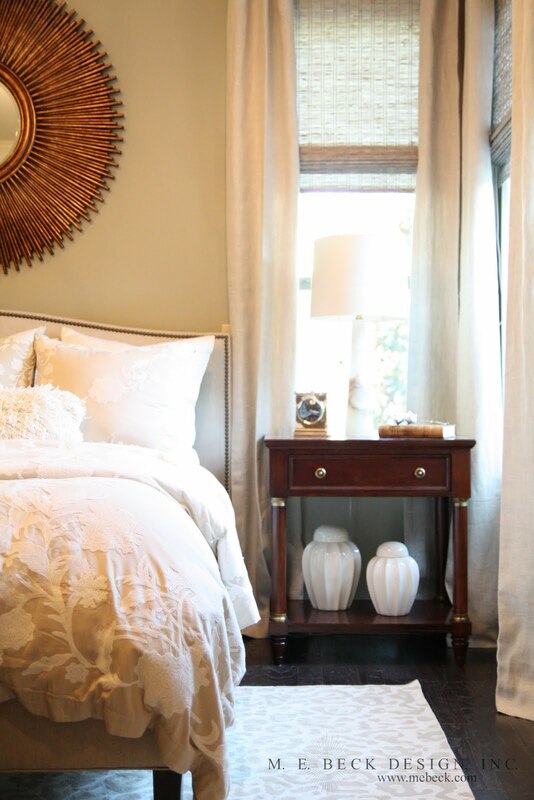 I love the mix of the warm, rich woods amidst a clean palette of warm grays and creams. Not pictured, 'cause that side of the room wasn't done ;-) is a beautiful antique mahogany Chippendale piece with gorgeous carved blind fretwork on the glass doors. This piece was inherited from the husband's grandmother and complements the warmth of the nightstand wood. We are going to add a bench to the foot of the bed as well. You might recall my meltdown regarding my interior door color and the subsequent repainting, by my way too accomodating-so-as-not-to-upset-the-pregnant-lady episode. Well, you are viewing the project where I specified the color on the doors that sent me reeling, and I immediately wanted my doors to be this color instead of black. Aren't they beautiful?! I never get tired of sunburst mirrors! Speaking of sunburst mirrors...there has been a lot of talk around the blogosphere lately about what is trendy and if sunburst mirrors are still "in". They've been around since Louis XIV for cryin' out loud people!!! He was known as 'the sun king', did you know that? Anyhoo, I think that eliminates categorizing sunburst mirrors as "trendy" don't you?! The master bathroom is one of my very favorite parts of this home. We washed the whole space in delectable Cararra marble. The vintage style freestanding tub and it's cashmere finish made me stop what I was doing the day that it was installed and do a little happy dance to the interior design Gods :-) It is so beautiful! 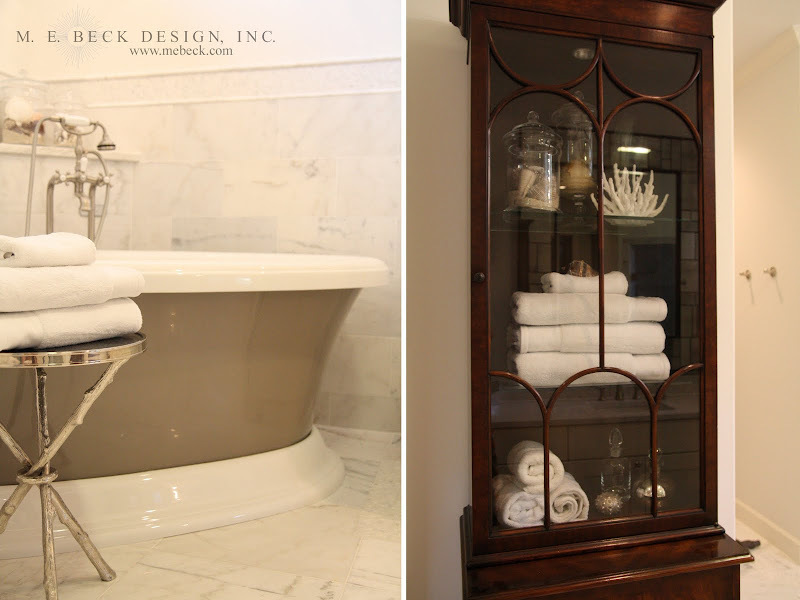 We carried more of the rich wood into the bath on a linen cabinet instead of having a basic, builder grade built-in put in. It is the perfect warm contrast to all of the monochromatic marble. The cabinet below has closed storage for items that aren't display worthy. We used mercury glass knobs on the vanities. Keep an eye out for more posts to come showing you more of this gorgeous home. Well, we've finally completed a little more work for little missy's room. If you missed it, check out Part I here. My husband and I had this past weekend free, which are few and far between these days, and so we decided to work on a few DIYs for our girl. The photo above shows our handiwork :-) This is actually wallpaper but it is textured and paintable and really resembles true beadboard. 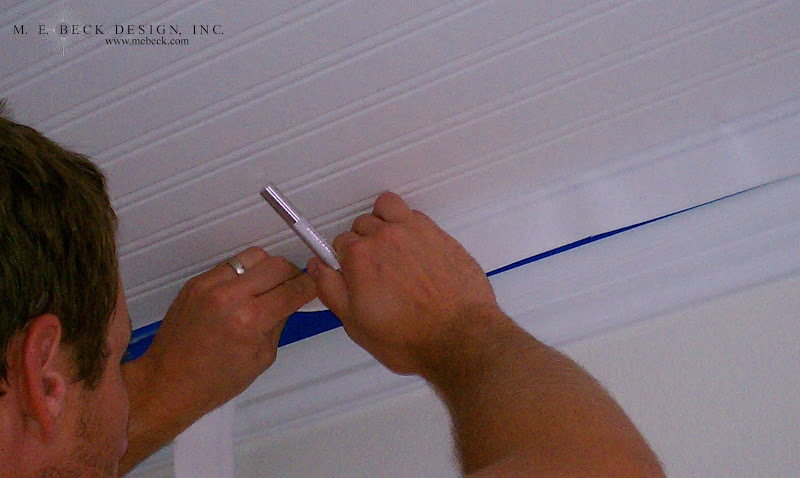 Real beadboard was not in the budget, so I found this product and we gave it a shot. We hung the paper ourselves to save on installation fees. I do not recommend doing this with your significant other if... a) you are 8 1/2 months pregnant, ahem b) don't handle stress very well c) don't have a strong marriage. Because the paper is foamy, it painted really easily, which made the hubs happy. 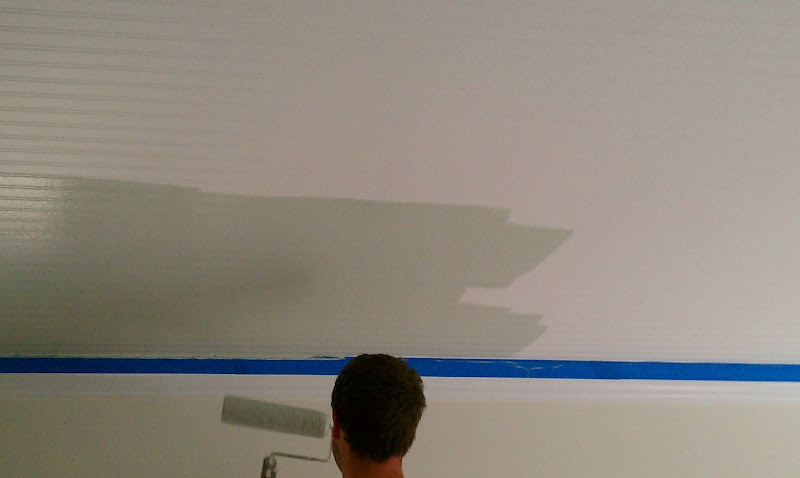 We painted the ceiling the prettiest blue-green color that I pulled from my main fabric. 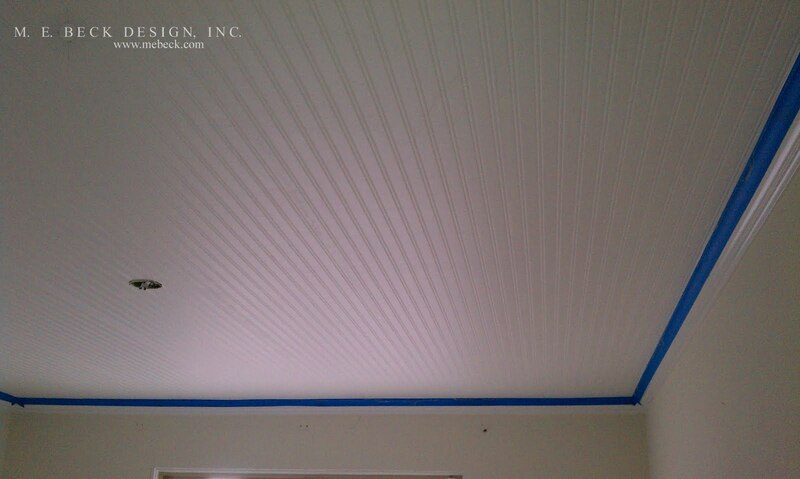 It reminds me of a haint blue porch ceiling on an old colonial home. 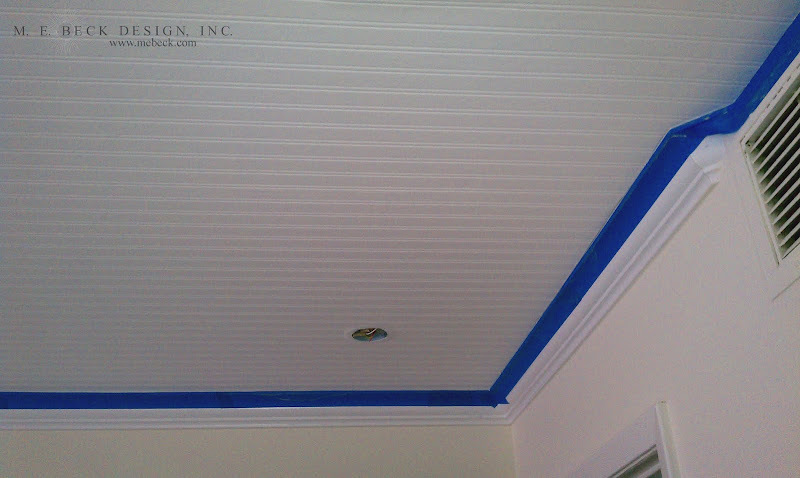 You know...it's been said that people used to paint the porch ceilings shades of blue because it fooled bugs and birds into thinking it was the sky so that they wouldn't set up home there...hmmm. I couldn't be happier with the result. It made the boring, smooth sheetrock ceiling much more interesting. We also hung the chandelier once the ceiling was done. I found the cutest antique Italian tole chandelier in a local antique store. It had been painted numerous shades over the years but had ended up all white, which I actually quite liked. 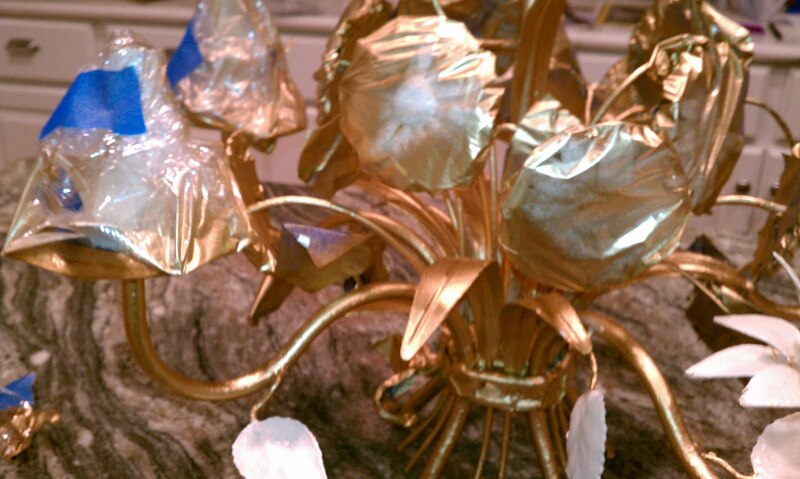 I decided to spray paint the stems of the bouquet in gold (I'm accenting with lots of gold in the room) and leave the flowers, leaves, and tie all the old white. I love how it turned out! I love where the paint is getting chippy and the rust of time is showing through. I think that is so charming! So, I'm feeling like the room is moving right along, which is good since our girl will be here before we know it! We'll be installing drapes and blinds next, eeek!